Nose: spontaneous with a noble oxidation, old leather. Palate: perfectly balanced, incredible structure, deep complexity, almost infinite persistency, perfect marriage of the fruity and floral notes supported by a discreet woody taste. The S.O.B. Exceptional Francois Voyer Grande Champagne Cognac is a wonderful example of an artisan created product. S.O.B. stands for Selection Olivier Blanc, and has been created to showcase a small, carefully selected group of 5 producers who have shunned the mass-creation of Cognac to concentrate on a hands-on approach. To this end they own their own vineyards within the premier terroir of the region - Grande Champagne, and carry out every aspect of Cognac production in-house. 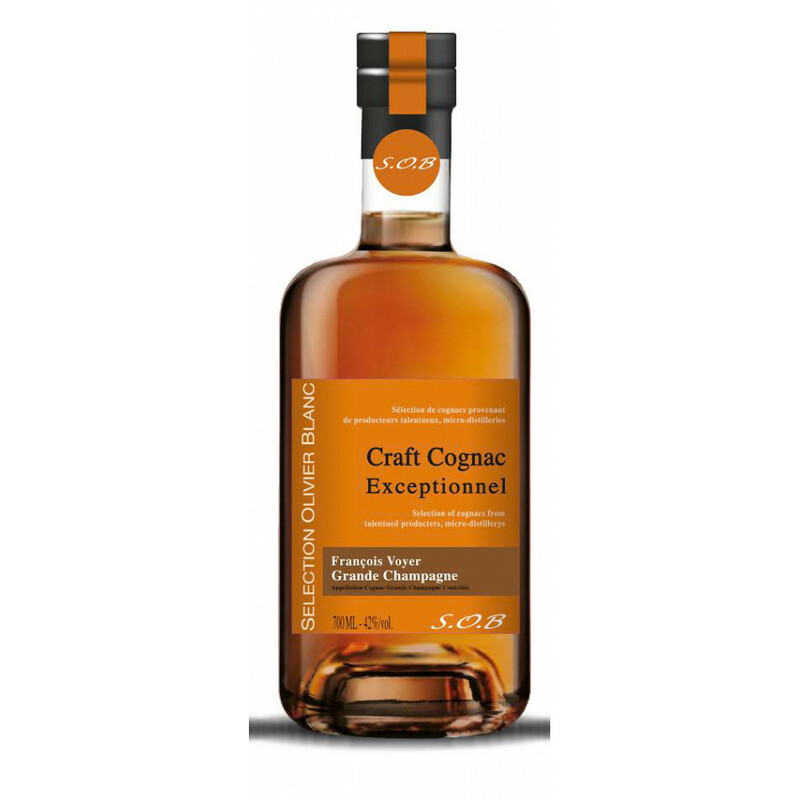 The end result is a truly wonderful 'extra' quality Cognac that will appeal to any lover of fine liquor. From the moment you set eyes on it, this Cognac offers a treat for all the senses. Best enjoyed neat, in good company, and when you truly have the time to savour the years and hard word that's gone into creating such a delight. I must say, these blends Monsieur Blanc selected are of high quality. The bottle seems unspectacular.. but you're wrong! I really love this new concept.. Although, this one sort of keeps its surprise until the after taste: the nose is a great, then the mouth is sort of balanced but not thaaat remarkable, the finish is absolutely crazy! S.O.B - - the Olivier Blanc Selection is a selection of 5 talented producers of Grande Champagne Cognacs, each with their own vineyards, distillery, and the ability to carry out all bottling on their own estated. Each of these producers has been specifically selected by Olivier Blanc - a man who's passion for Cognac and quality spirits is renowned not only in France, but around the globe. Tasting review: Color: Matured amber Nose: Winter flowers, heather, candied fruits, spontaneous and matured. Palate: Tender viscosity, elegant, harmonized, notes of pomegranate, generous and persistent. Tasting review: Color : rich amber. Nose : Warm, plum, nuts, iris, and sweet vanilla. Palate : Nice structure, pleasant length, fruity and woody notes, hazelnut. Tasting review: Color : Deep amber with sparkles Nose : Nice complexity, finesse, sweet spices, floral atmosphere, yielding freshness and the desire to dive into it. Palate : brioche, touch of exotic fruits, wood and spices perfectly harmonized.